With the most competitive prices online, All Star Motorsports is the number one stop for wheels, tires and packages! 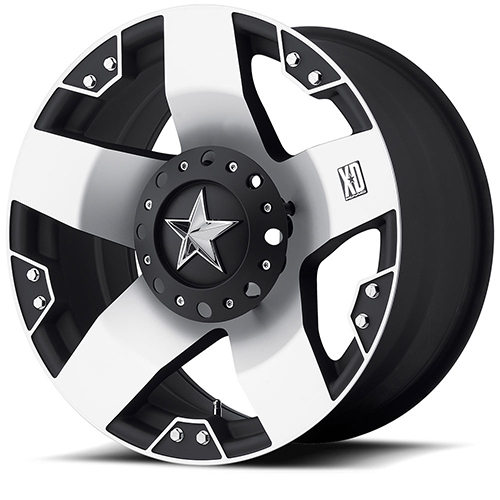 We offer the Rockstar by KMC Wheels XD775 Rockstar 17x8 8x165.1 10 Offset 130.81 Hub Machined Face With Matte Black Windows wheels in many different sizes and finishes at great prices. Utilizing great craftsmanship and precision machining, the Rockstar by KMC Wheels XD775 Rockstar 17x8 8x165.1 10 Offset 130.81 Hub Machined Face With Matte Black Windows wheels provide not only a great ride, but a great look to match. If you have any questions about fitment, give our experts a call and let them help you find the best fitment possible for your car or truck. If you are looking for a wheel and tire package, we have a great selection of tires you can choose from. We provide you with best prices on package deals, which are not only shipped free to your door within the U.S., but we also mount and balance every package at no cost to you in order to ensure the best possible ride. We also throw in a set of lug nuts at no cost.